I bought a little FLIP Ultra video cam last week. I don’t really have a clue how to work it yet. The first video I made I turned it sideways to get in more field of vision but then had the devil of a time figuring out in a program how to turn it vertical again. Finally, I figured it was just taking too much time for now learning how to cut and edit so much of it for YouTube. So you can’t see the first part of the demo of working on the paintings I showed you in the previous post. SO, I made two little short ones from another angle and left as much of ME out of it as I could. I have no idea who that old fat woman is in the video. 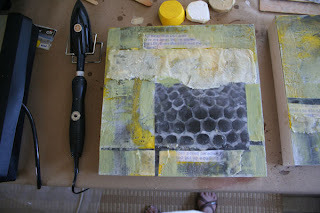 (smile) Anyway, it was hot in my studio kitchen…good place for hot wax, huh! I’m also uploading the two 12 x 12″ panels that I’m titling They Paved Paradise 1 & 2 since I got some of my inspiration from that old song, Big Yellow Taxi by Joni Mitchell. It wasn’t too long a day in the studio. 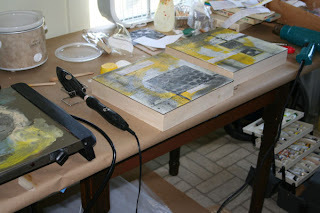 However, the time spent was fruitful…although it got hot with all the wax medium making and the palettes heated up. Almost 100 degree heat and hot palettes…yow! I started working on two small panels for the Global Swarming show the other day and just had to wing it on what I was going to do next. Months ago I was driving down the road and I heard the old Joni Mitchell song…”Big Yellow Taxi”. It hit me like a ton of bricks..maybe I could use some of the lyrics as a part of my work for the Global Swarming show. I DON’T DO THEMES….I keep saying. Anyway…I have to for this show. 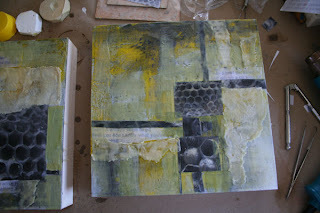 So last week some of us worked on a couple of collaboration pieces but I still had to do a few of my individual pieces. These pictures are about a 1/3 – 1/2 of the way into the process probably. …maybe more. Okay…….so it’s cheesy…but that’s all the ideas I have on themes. 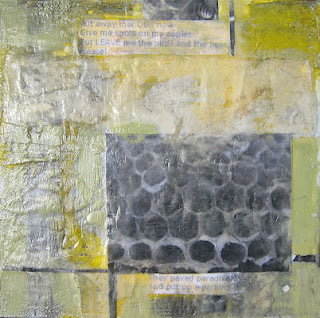 I just do what I do with paint and collage and hope it will work out. 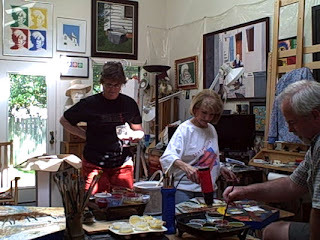 Carolyn sent me a couple of snipped pics from the video of all three of us working on our Collaboration for the Global Swarming show. More learning curves. Learn Corel Video Studio to go along with my new PSP program. Monday was a great day……doing something I’ve never done before, Collaboration with other artists on a project. 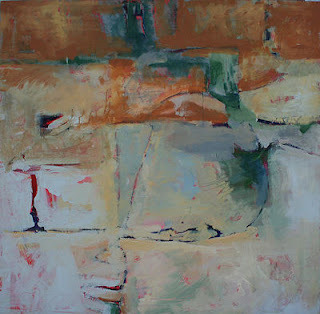 We have a big encaustic show coming up and opening the first of September for TexasWax-Dallas. 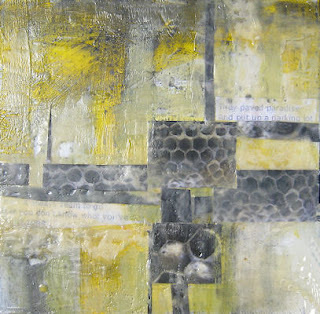 The showed is titled, “Global Swarming” (of course take off on global warming and bees swarming, etc.) and it will be the first show for the renovated Discovery Gardens building gallery at the TX State Fairgrounds. These old Art Deco buildings are wonderful and it’s great that they are being renovated. I haven’t started my individual pieces for that show yet……..BUT, we are also having small groups of us collaborating on a couple of larger pieces. Three of us live about 130 miles away in north eastern TX, so we decided to get together at one studio and work on them. Carolyn Fox-Hearne and Larry Kitchen (both instructors at Kilgore College) and I got these pieces going in Carolyn’s studio. 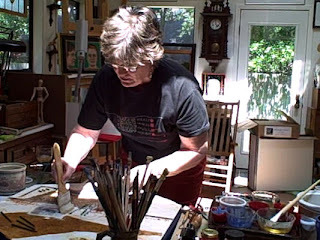 We even made a small video with Carolyn’s new little Flip Video of the last hour. Only problem….back to my learning curve. I don’t know yet how to get a still or two out of the video file. I’m gonna learn though. AND, we don’t want to share our pieces yet either. I’ll post them just as the show opens or around that time anyway. So sorry, no pics/videos…I did want to put in one still but I haven’t figured it all out yet……..along with loading and unloading old and new fridge and g-kids today.